Senior Division side Ballycane Celtic did just about enough to earn their place in the last eight of the League Shield when they narrowly defeated Premier Division side Kilcock Celtic. The game kicked off with the home side in the ascendancy and Ciaran Tighe should have given them the lead after 11 minutes but the clown rushed his shot and blazed over when it seemed easier to score. Both sides were now playing some impressive passing football. At the other end, Richie Mullins broke through from midfield but the poor unfortunate chap also failed to hit the target. The visitors eventually made the breakthrough when striker Keelen Noone was taken down outside the box. He took the kick himself and caught Kilcock 'keeper napping, curling the ball just inside the right post. the Ballycane defence. 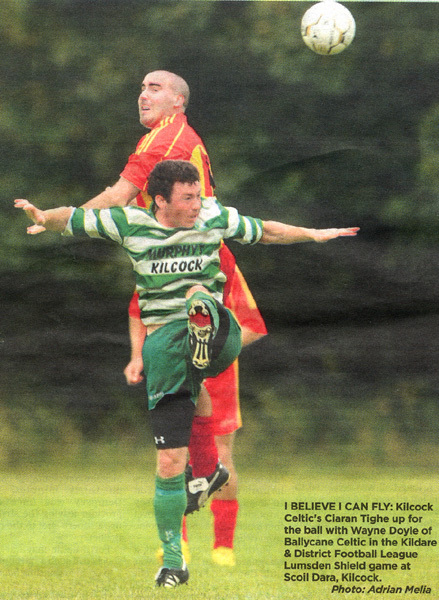 However Kilcock had a mountain to climb when the visitors netted a second. Mullins rose to meet a Fennell free kick and nodded down for Noone to slot home his second goal of the match. However Kilcock responded well and were back in the game when Fiachra O'Muircheartaig was taken down in the box. Despite a less than confident run-up and a scuffed shot Ciaran Tighe just about got his spot-kick past Ballycane keeper Gary Murray. Kilcock almost brought the game into extra time when Mark O'Connor won them a corner in the final minute and Cormac Moran rose majestically - almost Ciaran Tighe-esque - above the visiting defence flashing his header just inches over the bar. Keelan Noone, Patrick Cully and Martin Sullivan impressed for the winners, while an unlucky Kilcock had stars in Ciaran Tighe and Fiachra O'Muircheartaig in midfield, and Mark O'Connor. Following the match Ciaran Tighe was seen wildly flapping his arms in a somewhat absurd, and ultimately futile, attempt to get airborne yet again.